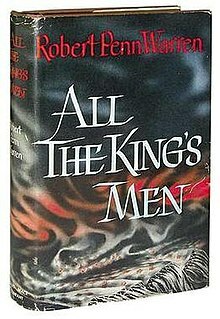 I recently re-read Robert Penn Warren's "All The King's Men" and enjoyed nearly as much as when I first came across it during a course while in college. I had read Robert Penn Warren as a poet and critic of the Fugitive Group, and I was never convinced even as an impressionable, nee gullible romantic by his attempts to persuade his readers that what we need is a return to an agrarian economy, and all the values and virtues that come with it. This was a return-to-Eden move that will spring up occasionally in the history of literary thought which seemed less an inspiration to improve life or make lives more authentic through action than it was to dodge the issue about the hard labor of living according to principles based on measurable action; its easier to talk the revolution into being than to hand out a leaflet. As such, I'm too much of a city kid, and even as a whelp thought that Warren's idealization of an old southern moral superiority to be soft at the center, not what I think poetry in the 20th century needs to be. Even then, the Fall-From-Grace idea creaked with over use, a rusty hinge with which to explain why things don't seem right with the modern world. Going to a Catholic School for a few years, with daily catechism and mass, will burn ideas into your head and, with luck,make you leery of them when the recur later in life with only a few alterations. Life in the city, even the idealized down towns of my imagination, was better than pouching the back forty, feeding the chickens, let alone waking up before sunrise to participate in a life that was loathsome to dwell on. Warrens poems to those virtues were lost on me; there was static where he intended music to be heard. He was a better novelist, and "All the King's Men" is a masterpiece on several counts, but the center attraction is Willie Stark, Warrens fictional depiction of Huey Long. Big, blustering, swaggering, a loud and dynamic presence of sheer Will-Too-Power who speaks of serving the people in direct and personal ways and swears to fight big ticket cheaters and scoundrels on their behalf , but who is seduced not by the passion for justice than by the accumulation of power for its own sake. The novel becomes a tragedy, a loud, tawdry, intensely observed tragedy as Stark declines and dies pathetically and nothing and no one in his wake is changed for the better. Matters by novels end seem as though they will only get worse for sometime to come, which is part of the price humans pay for giving over their own social obligations to work as a community to a charismatic figure who, despite protests to the contrary, has stolen their birthright to self-governance and has himself mistaken himself as the source of all moral authority.